We are very privileged to have some wonderful young people working for Pro Football Training. All our coaches are available for Private One-to-One and Group Coaching sessions, please contact us for further information or to book a session. Reece joined PFT in 2011 and has played a major part in our successful growth. His nature and attitude towards learning and continual improvement are vital components in youth development. Reece recently returned from a successful stint in Victoria with Oakleigh Cannons and currently plays for Perth Soccer Club in the WA NPL. Coaching Philosophy: Allowing children to play with freedom within a positive environment, taking away all fears and pressures. Career Highlight: Call up for U20 Australian team to play against Argentina. Sitting on the bench for Perth Glory against Celtic at NIB Stadium. Best Piece of advice given: Never give up. Advice for young players: The only person who is going to hold you back from achieving your dreams…. is yourself! Advice for parents: Don't live your dreams through your child. Sit back and enjoy watching your children play. Dean’s constant encouragement with the players is excellent and he is a very well respected member of the team. 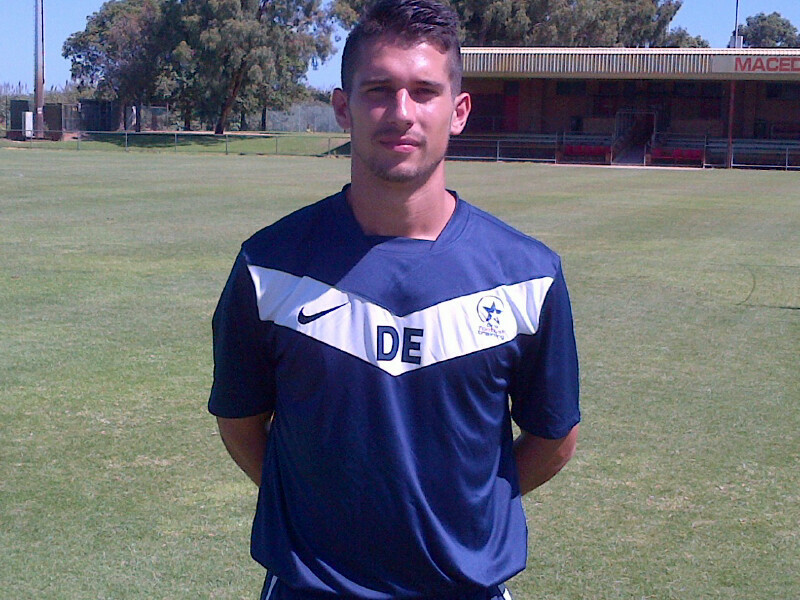 Dean currently plays for Perth Soccer Club in the WA NPL. Coaching Philosophy: Focusing on all the aspects of football - Technical, Tactical, Mental, Emotional, Physical and Lifestyle.As a child, practice is the key to improvement! Having 1000+ purposeful touches of the football a day will help you to progress and improve. Career Highlight: Playing in a pre season tournament against Chelsea, Aston Villa and Blackburn Rovers in front of 45 000 people in Hong Kong. Best Piece of advice given: With anything in life, if things are going well you think you no longer need to maintain them, but sometimes people forget how they arrived at that positive place and what keeps you there. 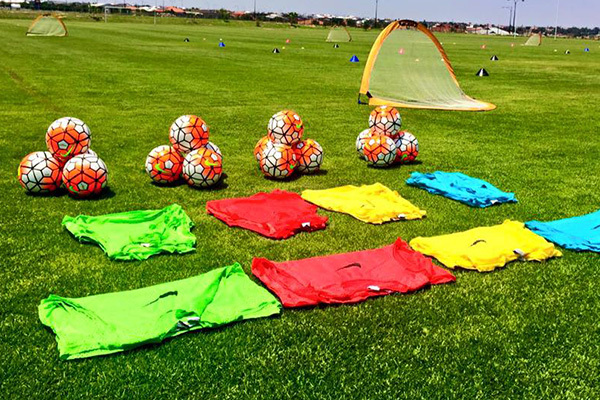 Advice for young players: Enjoy every minute of training, listen to the coaches and practice as much as possible. 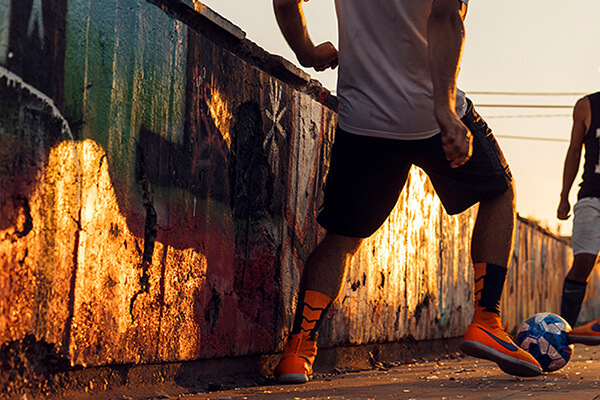 Every minute spent with the ball will benefit you. Most importantly play with a smile on your face and work hard to be the best that you can be. Advice for parents: Support your child and always provide positive feedback instead of looking for negatives. Football is about having fun, meeting new friends and for the child to improve and ultimately to create a happy lifestyle. Children always looks up to there Mum and Dad so never stress them out about training, always provide a positive environment. Josh is the youngest member of our coaching staff. 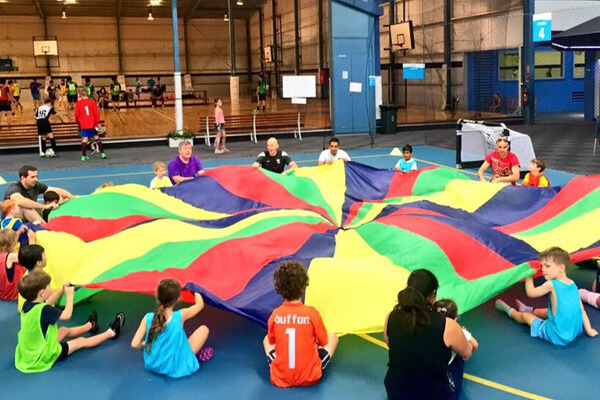 His enthusiasm is infectious and the children love his level of engagment and fun throughout the sessions. 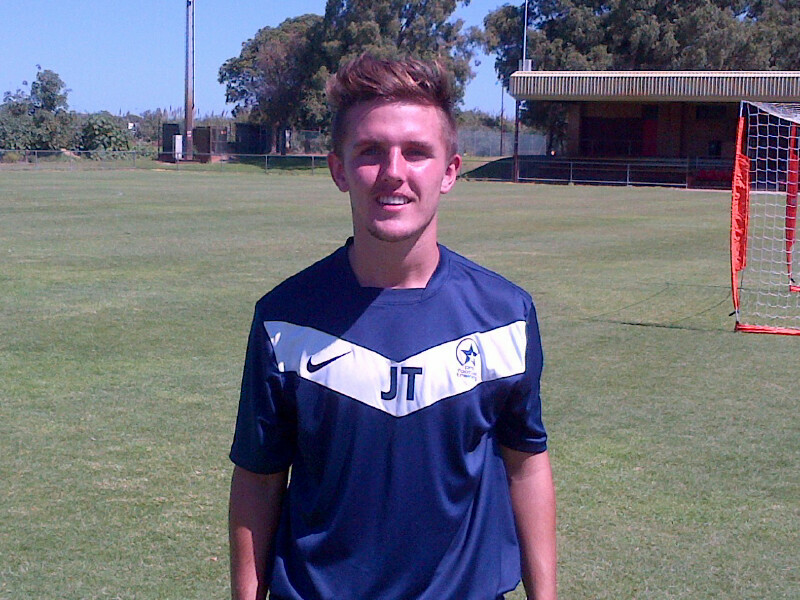 Currently Josh plays with ECU Joondalup after starring with Perth Glory in the 2013/14 Youth League and in the WA NPL. Coaching Philosophy: Always leave the session/game knowing you have been the best you can be. Career Highlight: Playing against Barcelona u17s in Korea where I played my best game of tournament. Training with Arsenal in such a wonderful venue and making the All-Star team at the AIS institute challenge. Best Piece of advice given: Not to worry about outcomes, keep focusing on the process. Advice for parents: Let your kids play, be constructive not negative. Life away from football: If I’m not playing football im doing extra to try stay and step ahead by training and studying the game. I have recently left school and love coaching at Pro Football Training and MLFC. 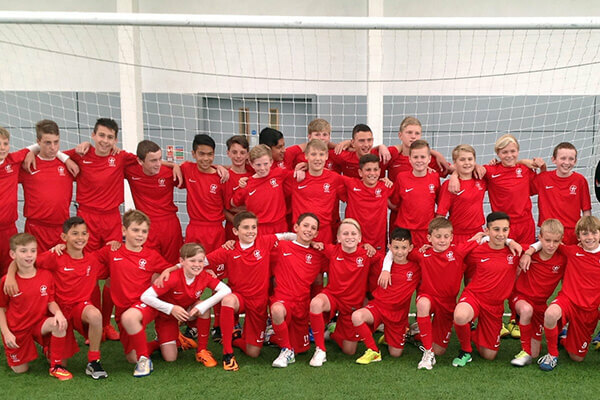 State/County Honours: WA u14s, WA Futsal Team u13s, 15s & 16s. Coaching Philosophy: Creating a positive and friendly environment that encourages children to learn and develop on and off the football pitch. Best Player played against: Mitchell Oxborrow. Although I’ve never been one to really focus on who I’m playing, I just try and stop them from scoring! Career Highlight: Probably not the most prestigious, but saving a penalty on my State league debut at 17 with my family in the crowd is a moment that makes me proud. Advice for young players: Football at times can be stressful, but it shouldn’t be. Look after yourself, your family, and just enjoy the beautiful game. Do this and the rest will follow. Advice for parents: Encourage and allow your children to play. Promote football to be about fun, making friends and being healthy; not about scores or winning games. Life away from football: I’m currently studying Psychology at University, and try to find ways to incorporate some of the things I learn into my coaching. I also love spending time with my family and friends. Clubs Played For: Liverpool FC, Stoke City FC, Bristol City FC, Melbourne City FC & Perth Glory FC. International Honours: Represented Australia U17’s at the World Cup in Mexico, as well as Australia’s U20’s in the World Cup Qualifiers. 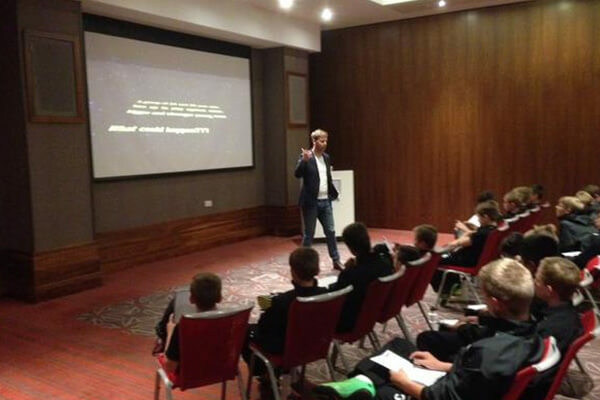 Clubs Trialled with: Manchester United, Manchester City, Liverpool FC, Everton FC, Blackburn Rovers FC. Coaching Philosophy: To create a positive environment where players can enjoy themselves and improve at the same time. Best Player you have played with: Luis Suarez, Steven Gerrard, Raheem Sterling. Best Player played against: Paul Pogba. Career Highlight: Playing in the U19 Champions League for Liverpool, representing Australia in the U17 World Cup and playing in front of 60,000 in a tournament final against Borussia Monchengladbach for Liverpool’s U18’s (we got battered 3-0). Best Piece of advice given: It’s hard to beat a person that never gives up. Advice for young players: Enjoy every moment you have a ball at your feet, try new tricks and be creative. There is no secret to becoming better at football, only practice! Advice for parents: Help contribute to your children’s enjoyment of football with encouraging words and positive feedback. Children love playing football, but they also love positive reinforcement from their parents! Life away from football: Whilst still pursuing a football career, I’ve taken up online University, studying Business and Finance. It’s also great to be back in Perth with all the mates I grew up with. Anth had a very successful playing career in England playing in the English Premier League with Middlesborough and Wolves. He brings this experience plus his great imagination and creativity to PFT Sessions. 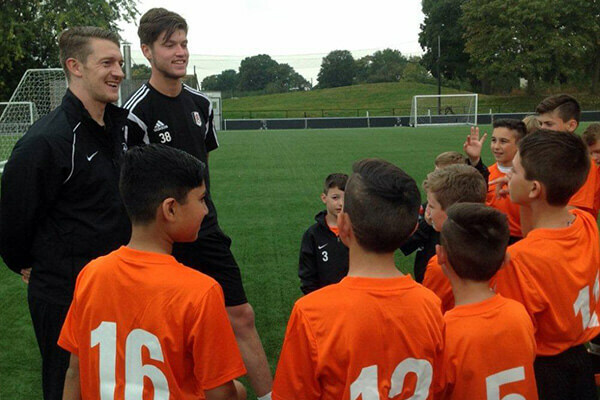 Clubs Trialed with: Wolverhampton Wanderers (luckily I had a blinder in a reserve game!) but trials make me cringe! Career Highlight: Playing for England at schoolboy level makes me proud, however this might sound strange, but playing for Brandon United in the Northern Premier League in England is still one of my highlights. Mainly because we just had a great philosophy of playing good football and we just had a lot of fun! Best Piece of advice given: Don’t worry about mistakes - Nobody has invented the time machine yet so there is nothing you can do about it. Only to go and try again to improve. Advice for young players: Just have fun, love the game and listen. Advice for parents: Sit back, relax and enjoy! As parents will know, you’ll never get told anywhere near enough how much you are appreciated but trust me all of the driving to training and games, and financial support doesn’t go unnoticed! You are critical to their development just by being available so you might as well just enjoy the game. Life away from football: Unlike Mark and Baz I have a ‘real’ working for Rio Tinto in the mining industry which takes up a lot of time. I tend to spend all my spare time with my wife Alana and our little girl Evie. Aleks is our Goalkeeper Coach and brings his experience and personality to every session. Aleks currently plays for Stirling Lions in the WA NPL. Coaching Philosophy: Football to be played in a fun, positive, friendly and professional environment where players can develop to their full capacity under no pressure. Barry and Mark share their experiences and opinions on the game over a skinny latte with honey (Mark) and a large long mac! ML: My Mam (Pat) and Dad (Austin) and wife (Marianne) have been the biggest influences on my career. As my Mam was a teacher she understood children and was a wonderful mentor and supporter of my football career. She used to drive me to every training session, trial, match etc and was always there to give me honest feedback and guidance. My Dad was fantastic and looking back now I realised that he was a huge influence on my career. He would always give me an honest evaluation of my performance and encouraged me to believe in my ability. Even when he was thousands of miles away in the UK he would ring me in the early hours of the morning to wish me good luck when I was playing for Perth Glory. Don't ask me how but he always managed to call me if we were playing away and call me in my room at the hotel! Marianne has been amazing as well and used to put up with my moods if I had played a poor game. She also came to watch me play and would always be there for advice and support. I was very lucky to have such strong family support and without this I doubt weather I would have had the career I did. BW: My mother and grandad (Papa) have provided amazing support and dedication to give me the best possible chance in everything I have chosen to do. My Papa drove me everywhere, we used to talk about the game and he was always very honest. He never used to shout out instructions from the sidelines, but I knew when I had to be better because he used to whistle. With the advances in Sports Science and Sports Psychology, along with the internet, the knowledge you can gain from studying the game is huge, Bill Beswick and Steve Bull have produced excellent work and any player/coach/parent would do well to read their studies and gain a better appreciation of what it takes to be a footballer. I wish I was a young player now with access to all these tools. I have to say now in coaching Kylee puts up with a lot, being out six days a week, at times we could be out having dinner or visiting friends, but she has given me wonderful support throughout. What is your biggest achievement in Football? ML: I realised my childhood dream and became a professional footballer at the age of 17. This is all I ever wanted to do and to sign as a professional footballer and to be paid for something you love doing is an amazing feeling. When I was a YTS player at Scarborough I made my first debut at 16 against Preston North End and was the youngest ever player at the times to make his debut which made it extra special (yes, my Dad managed to get to that game as well!). To win the Gold Medal here in Perth was amazing and then to play in the A-league for Perth Glory at 27 was very special. What made it even more special was that my Mam, Dad and Marianne were able to see my make my home debut against Adelaide Utd. BW: I was honoured to represent Scotland at u18 level and also played in European Competition whilst still in Ireland. Now being able to influence young players in a positive manner is fantastic and much more rewarding than when I played the game. ML: Paul Gascoigne who used to play for my hometown club Newcastle United. He played with freedom and creativity and with a smile on his face. I used to model my whole game on him. When I was 11 I met him on a train when he was playing for Tottenham Hotspur - he was superb with me and we sat and talked all of the journey up to Newcastle (3 hours). Unfortunately his career and life has taken the wrong route but in my eyes as a footballer he was the best. Ask Barry about his goal against Scotland in Euro 1996! BW: Denis Law was my hero, he and Kenny Dalglish have been the only two truly world class Scottish players. I have been going on about Andrés Iniesta for years and think that he is the best player in the world right now. For true professionalism Paul Scholes, he is a superstar but rarely do you see him in the press or on TV, the way he balances his life with football is the best example to any young player. PS: I never actually seen Gazza's goal live cos we had just missed a penalty at the other end and I was sitting with my head in my hands...That England team were quality though and should have won it that year, they seemed to suffer from the same complex Gary McAllister had in that they couldn't take penalties!! Who is the best coach you have played under? ML: Ian Kerr when I was at Scarborough always encouraged me to express myself and was a coach who I felt believed in me and never put any pressure on his players.. As a coaching mentor, Kenny Lowe, has had a big influence on developing me as a coach and gave me guidance as a player and now a coach. However the best coach I have ever had was my Dad who used to spend hours in the back garden playing football tennis or working on my technique with me. At then end of every session I would also say to him "5 more minutes Dad!" which highlighted how much I loved training with him. BW: George Mackie and Donald Park(currently the Head of Coach Education at the SFA) were hugely influential, they signed me at Meadowbank Thistle when I was fifteen and give me a great deal of insight into being a player. Here in Perth, Kenny Lowe has been a great influence and he also coached me whilst at Perth SC, his sessions are always fresh and challenging. Without being overly biased Mark is the best coach around, the energy and enthusiasm he brings to every session is fantastic, I learn something from him every week and he has helped me become a far more accomplished coach. ML: Rio Ferdinand, John Terry, John Barnes, Ian Rush and Harry Kewell were the best I played against when I was in the UK. In the USA I played against Robert Preki (former Rec Star Belgrade, Everton and USA player) in a pre season friendly when he played for Miami Fusion - he was the best I have played against. Whilst in Australia and playing in the A-League there have been many famous players but the best I played with was Hayden Foxe - he has played at the highest level but always treat everyone with respect loved playing the game. BW: I had the privilege to play against and alongside Paul McGrath, former Manchester Utd, Aston Villa and Rep. of Ireland legend. I played with two players in Ireland who will be unknown to most but Gary Dempsey and Alan Kirby were fantastic to play with, both were technically excellent but provided great vision and energy to the team. What is the best moment ever in football? ML: Gascoigne's goal against Scotland and every time I coach or play the best game in the world! BW: Being in the ground (Celtic Park, Glasgow) when Hearts won the Scottish Cup in 1998, then heading straight back to Tynecastle to celebrate and welcome the team home was magical. There have been hundreds of amazing moments in the game but I will always remember Paulo Di Canio catching the ball when Paul Gerrard the Everton goalkeeper got injured and was out the game, he could have simply scored but chose to stop the match so the keeper could get attention. An amazing act of sportsmanship! What has been your worst moment in Football? ML: When I was released by Hibernian FC at the age of 19 I thought my whole career was over and for a while fell out of the love with the game. I always had a feeling inside that I could get back to the professional level though so trained harder until I got another opportunity 8 years later! BW: Being injured is the hardest part of being a player, it’s very frustrating and always leaves you with a feeling that you are letting people down. My worst memory of football would have to be one week in May, 1986 when Hearts lost the Scottish Championship to Celtic on the last day of the season by goal difference then got beat off Aberdeen in the Scottish Cup final a week later, I still cannot believe we didn't win the double! In the history of the game though the saddest moment would have to be the Hillsborough Disaster when 96 Liverpool supporters lost their lives at the FA Cup Semi-Final against Nottingham Forest in 1989. What three things best sum up your philosophy towards football? Away from football what do you like doing? ML: Spending time with my family, wife Marianne and our sons Daniel and Joshua, and our friends as well as when our family visit us from the UK. I also love to run and compete in the local races. Going for PFT meeting with Baz is always enjoyable! To be honest though I am never away from football and would still play 24/7 if I could. BW: I most enjoy relaxing with my wife, Kylee and travelling to new places. I love to play golf, watching Cricket and enjoy the theatre, eating out and seeing live music. I can't say that I have much time away from football, at least thinking about it anyway, I carry a notepad with me everywhere I go and usually spend most of the time scribbling down new training sessions, usually over coffee with Mark but he has started to ruin all my pencils so going to buy him a set of crayons for Christmas! 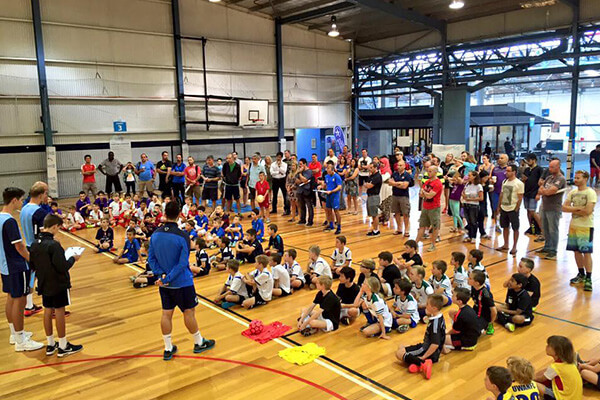 Pro Football Training Directors Mark Lee and Barry Wood along with coaching staff, Reece Vittiglia, Dean Evans, Josh Tucker and making his clinic debut, Lewis McMahon, were delighted with the record attendance at the July Skillz Clinics with 403 children attending.